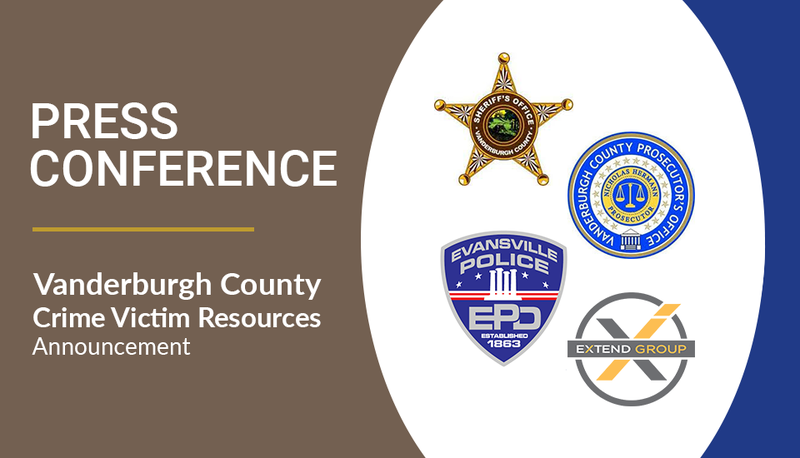 EVANSVILLE, INDIANA ­– August 30, 2018 ­– The Vanderburgh County Sheriff’s Office, Evansville Police Department, Vanderburgh County Prosecutor, and EXTEND GROUP will unveil their community collaborative initiative, the Vanderburgh County Crime Victim Resources (VCCVR). These community leaders invite everyone to attend the press conference at 10:30 AM on September 12, 2018, outside of the Civic Center in Downtown Evansville. The Vanderburgh County Sheriff’s Office, Evansville Police Department, and Vanderburgh County Prosecutor will explain the Crime Victim Resources as well as its impact on the Vanderburgh County community. EXTEND GROUP will wrap the conference up with a demo of the new Vanderburgh County Crime Victims Resources (VCCVR) website. For more information on the press conference, contact any of the four agencies or email [email protected].